P.F. 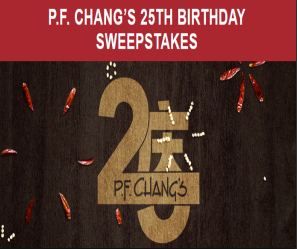 Chang’s 25th Birthday Sweepstakes & IWG – Win a trip to any city in the world that has a P.F. Chang restaurant & more! Win a trip for two to any city in the world that has a P.F. Chang’s restaurant! ENTER SWEEPSTAKES HERE – P.F. Chang’s Sweepstakes page. ENTRY LIMIT – Each entrant may return to the Promotion Site one (1) time per Day during the Promotion Period. ELIGIBILITY – P.F. Chang’s 25th Birthday Sweepstakes is open only to legal residents of the forty-eight (48) contiguous states of the United States and the District of Columbia (excluding Alaska and Hawaii, Guam, Puerto Rico and all other U.S. and foreign territories and possessions) who are at least eighteen (18) years old at the time of entry. SWEEPSTAKES ENTRY PERIOD – The Promotion begins on July 1, 2018 at 12:00 a.m. Pacific (“PT”) and ends on July 25, 2018 at 11:59 p.m. PT. PRIZES – Sweepstakes Prize: ONE (1) GRAND PRIZE: A trip for winner and one (1) guest for a trip to any city in the world that has a P.F. Chang’s restaurant. Trip package includes round trip, coach-class air transportation for two (2) from a major airport near winner’s residence in the 48 contiguous states of the U.S. or D.C. (determined by Sponsor in its sole discretion) to selected city (winner is responsible for transportation to the major airport gateway and air transportation may include one or more stops); seven (7) nights’ standard accommodations at a hotel determined by Sponsor in its sole discretion (single room, double occupancy); $1,500 spending money (awarded as a check); dinner at P.F. Chang’s, valued at up to $200; and travel agent services. To the extent that winner selects a location and/or peak travel time where travel and accommodations cannot be arranged without exceeding the maximum budget of $9,750 (including travel agent fees), winner will have the choice of reducing the number of days or paying the additional amount. Winner must complete the trip within one (1) year from the Sweepstakes drawing date or prize will be forfeited. Trip must be booked at least twenty-one (21) days (or thirty (30) days if international travel is selected) prior to departure. Approximate Retail Value (“ARV”): $7,150 for domestic travel and approximately $9,750 for international travel. Maximum value for this prize is $9,750. Actual value may vary based on airfare fluctuations and distance between departure and destination. Winner will not receive difference between actual and approximate retail value. Odds of winning the Sweepstakes Prize depend on the number of eligible entries received during the Promotion Period. In lieu of the Grand Prize package, Grand Prize Winner may elect a cash option awarded as a $2,500 check. Check ARV: $2,500. SIXTY-SIX (66) $25 P.F. CHANG’S GIFT CARD PRIZES (3 awarded on each day of the Promotion except for July 5, July 13, and July 22): $25 digital gift card awarded. ARV: $25. ONE HUNDRED TEN (110) $15 P.F. CHANG’S GIFT CARD PRIZES (5 awarded on each of day of the Promotion except for July 5, July 13, and July 22): $15 digital gift card awarded. ARV: $15. EIGHTY-EIGHT (88) P.F. CHANG’S HAT PRIZES (4 awarded on each day of the Promotion except for July 5, July 13, and July 22): A P.F. Chang’s branded hat. ARV: $20.00. ONE HUNDRED (100) P.F. CHANG’S CUTTING BOARD PRIZES (Offered and awarded on July 5): A P.F. Chang’s branded cutting board. ARV: $12.90. their value (highest to lowest). P.F. 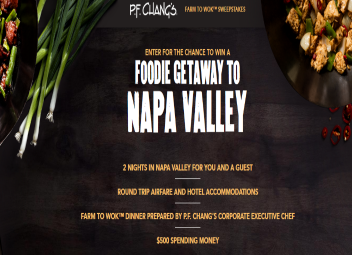 Chang’s Farm to Wok Sweepstakes & IWG – Win a trip to Napa Valley! ENTRY LIMIT – Limit: Each entrant may register one (1) time during the Promotion Period to receive one (1) Sweepstakes entry. You may return daily to enter again and try for the Instant Win Prize. There are various ways to earn bonus entries. ELIGIBILITY – P.F. Chang’s Farm to Wok Sweepstakes is open only to legal residents of the forty-eight (48) contiguous United States (including District of Columbia) (excluding Alaska and Hawaii) who are at least eighteen (18) years old at the time of entry. SWEEPSTAKES ENTRY PERIOD – The Promotion begins on August 1, 2017 at 12:00 a.m. Pacific Time (“PT”) and ends on August 31, 2017 at 11:59 p.m. PT. Sponsor in its sole discretion (single room, double occupancy); a dining experience with P.F. Chang’s corporate executive chef (all details determined by Sponsor in its sole discretion); $500 spending money; and travel agent services. Winner must travel on November 8, 2017 and return on November 10, 2017 or prize will be forfeited. Trip must be booked at least twenty-one (21) days prior to departure. Approximate Retail Value (“ARV”): $2,500 or $5,150 (depending on winner’s choice). Instant Win Game Prizes: TWO HUNDRED (200) SECOND PRIZES: A $25 P.F. Chang’s digital gift card, terms and conditions apply. ARV: $25. Odds of winning an Instant Win Game prize depend on the number of Instant Win prizes available divided by the number of eligible Instant Win Game plays. Limit: One (1) Instant Win Game prize per person. 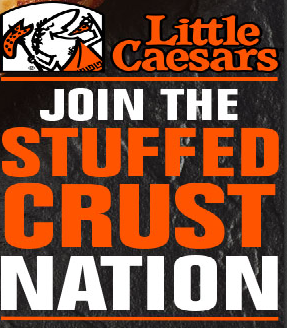 Little Caesar’s “Join the Stuffed Nation” Sweepstakes – Win pizza for a year! ELIGIBILITY – Join the Stuffed Crust Nation is open only to legal residents of the fifty (50) United States and the District of Columbia who are at least eighteen (18) years old at the time of entry. SWEEPSTAKES ENTRY PERIOD – The Sweepstakes begins on November 14, 2016 at 12:00:00 a.m. Eastern Time (“ET”) and ends on December 31, 2016 at 11:59:59 p.m. ET. 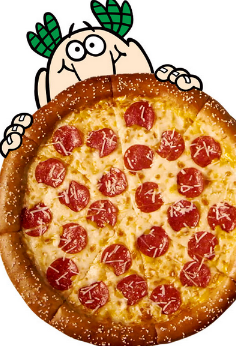 PRIZES – ONE (1) GRAND PRIZE: “Pizza for a Year”, awarded in the form of fifty-two (52) $10 Little Caesars gift cards. Approximate Retail Value (“ARV”): $520. FIVE (5) FIRST PRIZES: A $30 Little Caesars gift card. ARV: $30. TEN (10) SECOND PRIZES: A $20 Little Caesars gift card. ARV: $20. The Texas Roadhouse Trip 4 Two Giveaway Sweepstakes – Win a trip to Arizona! Win a trip for 2 to Arizona! 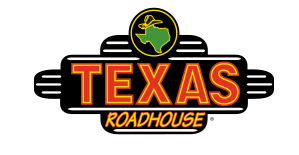 ENTER SWEEPSTAKES HERE – Texas Roadhouse Sweepstakes page. ENTRY LIMIT – LIMIT ONE (1) ENTRY PER PERSON REGARDLESS OF THE METHOD OF ENTRY. ELIGIBILITY – The Sweepstakes is open to all legal residents of the United States who are 18 years of age or older at time of entry. SWEEPSTAKES ENTRY PERIOD – The Texas Roadhouse Trip 4 Two Giveaway (“Sweepstakes”) begins January 25th, 2016 at 8:00 am ET and ends on February 14th, 2016 at 11:59 p.m. ET. Two (2) Country Thunder Florence, AZ Festival Passes for April 7th – 10th, 2016. 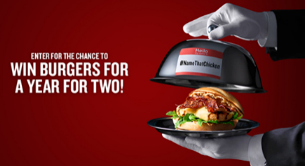 Red Robin’s Name that Chicken Burger Contest – Win burgers for 2 for a year! Win burgers for 2 for a year! ENTER SWEEPSTAKES HERE – Red Robin Sweepstakes page. You will need to submit your own original name and description of the Red Robin Chicken Burger to complete your entry. ENTRY LIMIT – Limit one entry per person and/or email address per day. ELIGIBILITY – Red Robin’s Name that Chicken Burger Contest is open only to legal residents of the fifty (50) United States and District of Columbia, and legal residents of the Alberta and British Columbia Provinces of Canada, who are at least twenty-one (21) years old at the time of entry. SWEEPSTAKES ENTRY PERIOD – The Contest begins on October 26, 2015 at 12:00 a.m. Eastern Time (“ET”) and ends on December 27, 2015 at 11:59 p.m. ET. PRIZES – Grand Prize: One (1) Grand Prize will be awarded Free Burgers for a Year for 2 at Red Robin, which shall be awarded in the form of twelve (12), fifty dollar (USD) ($50) Red Robin gift cards. Total approximate retail value: $600 (USD). 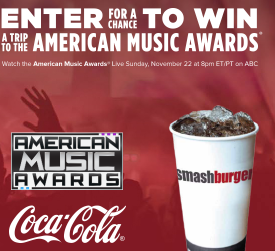 Smashburger / Coca-Cola® AMA Sweepstakes – Win a trip to LA for the American Music Awards! Win a trip to Los Angeles for the American Music Awards (2 winners)! ENTER SWEEPSTAKES HERE – Smashburger Sweepstakes page. ENTRY LIMIT – Limit: 1 Sweepstakes entry per person per day during the Promotion Period. ELIGIBILITY – The Smashburger / Coca-Cola® AMA Sweepstakes is open only to legal residents of the 50 United States (or the District of Columbia) who are 18 years of age or older at the time of entry. SWEEPSTAKES ENTRY PERIOD – The Sweepstakes begins at 12:00 a.m. Eastern Time (“ET”), August 25, 2015 and ends at 11:59 p.m. ET, October 26, 2015. PRIZES – 2 GRAND PRIZES: A trip package for 2 to Los Angeles, CA for the American Music Awards® on November 22, 2015. Trip package includes (i) 2 airline vouchers (each redeemable for round trip flight in the continental United States, details determined by Sponsor in its sole discretion); (ii) 2 nights’ hotel accommodations (single room, double occupancy; room and hotel determined per Sponsor choice); (iii) a ticket for winner and guest to the American Music Awards (seat locations to be determined per Sponsor discretion); (iv) a red carpet access pass for winner and guest; (v) a $200 gift card for the winner that may be used for spending money or ground transportation (gift card terms and conditions apply); and (vi) travel agent services. Winner must travel on the dates specified by the Sponsor, surrounding American Music Awards, or prize will be forfeited. Approximate Retail Value (“ARV”): $2,700. 5 FIRST PRIZES: Each winner will receive 52 free entrée coupons. Each coupon good for a free Smashburger®, Smashchicken® sandwich or fresh salad (each with an expiration of December 31, 2016). Limit one coupon per person per visit. ARV: $400. McAlister’s Deli “How Do You ‘Cue?” Sweepstakes – Win a $1,000 Visa gift card & more! Win a $1,000 Visa gift card & a $250 McAlister’s Deli gift card! ENTER SWEEPSTAKES HERE – McAlister’s Deli Sweepstakes page. ENTRY LIMIT – Limit one (1) Entry per person and per Facebook or website account per day. ELIGIBILITY – Open to legal residents of the fifty (50) United States and the District of Columbia (excluding residents of Puerto Rico and US territories and possessions) who are at least 16 years of age and have a valid email address. 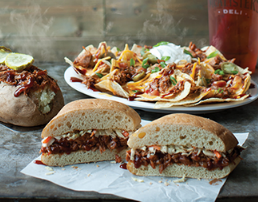 SWEEPSTAKES ENTRY PERIOD – The McAlister’s® Deli How Do You ‘Cue? Sweepstakes commences at 9:00:01 AM Eastern Standard Time (“ET”) on August 10, 2015, and ends at 11:59:59 PM ET on August 26, 2015. PRIZES – One (1) winner will receive a VISA gift card valued at One Thousand Dollars ($1,000.00 US) and a McAlister’s gift card valued at Two Hundred Fifty dollars ($250.00 US). Chipotle “Friend or Faux” Sweepstakes – Win Chipotle “Dinner for 2” gift cards! Win 52 FREE Chipotle Dinner For Two Cards (50 winners)! Plus, everyone who enters is eligible to receive a Chipotle BOGO coupon texted to their smart phone! ENTER SWEEPSTAKES HERE – Chipotle Sweepstakes page. ENTRY LIMIT – A limit of one (1) Entry may be submitted per Entrant regardless of method of entry and one additional Entry via either Twitter tweet or Facebook share throughout the Sweepstakes Period for a maximum of two (2) Entries per person. ELIGIBILITY – The Chipotle “Friend or Faux Sweepstakes” is open only to legal residents of the forty eight (48) contiguous United States (including the District of Columbia) excluding Alaska and Hawaii, who are at least thirteen (13) years old at the time of entry. SWEEPSTAKES PERIOD – The Sweepstakes begins on July 21, 2015 at 12:00:01 a.m. Eastern Time (“ET”) and ends on August 31, 2015 at 11:59:59 p.m. ET. PRIZES – Fifty (50) Grand Prizes: Chipotle Dinner for Two for winner and a friend awarded in the form of one set of fifty-two (52) Free Chipotle Dinner for Two Cards (value of up to $25 each card). Each card is good for two free entrees (burritos, bowls, orders of tacos or salads), one order of chips and guacamole and two fountain drinks. Approximate Retail Value (“ARV”) of each Grand Prize $1,300. One Hundred (100) First Prizes: A catered Chipotle party for twenty (20) “friends or faux” awarded in the form of a Chipotle Catering Card for twenty (20). New York City residents will receive a Burritos by the Box party for 20 instead of a catering card. Approximate Retail Value (“ARV”) of each First Prize $260.